Did you have chicken pox as a kid? If so, you remem­ber the pain and itchiness, and were probably relieved to learn you could only get chicken pox once. And techni­cally that is true, but a case of shingles will feel very much like that childhood illness — only worse. That is because shingles is caused by the same virus. The virus that causes chicken pox can lie in the nerves of your spine for years, decades even. Then, usu­ally after age 50, the virus may become active again if you puffer an illness that lowers your body’s immune system. If you have Hodgkin’s disease, leukemia, or AIDS, or have received an organ or bone marrow trans­plant, you’re definitely at risk. But sometimes, something as simple as stress or the common cold can trigger the virus. 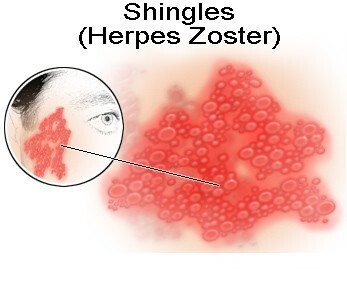 A case of shingles is much more painful than chick­en pox because the herpes zoster virus attacks your nerves. The blistered area will follow the path of the infected nerve, most often along your ribs, back, or side, but sometimes on your shoulders, arms, or face. If the blistery rash affects your eye, it may damage your cornea, and you could lose your sight temporarily or permanently. After running the course of symptoms, shingles will most often clear up by itself. It is, after all, a virus. But that doesn’t mean you have to just lie there and take it. It is severely uncomfortable, so you need to take an active role in your recovery. This will relieve your feelings of helplessness. Hands off. Just like they told you when you had chicken pox — don’t scratch. You don’t want to break open the blisters. They are full of the shin­gles virus, and spreading them will only prolong your discomfort. Cut your fingernails and consider wearing gloves or mittens to bed. You may undo all your good intentions by scratching in your sleep. Soak the itchies away. Fill the tub with warm water and sprinkle in any of the following: one to two cups of Aveeno powder, one-half to one cup of baking soda, one to two cups of finely ground (colloidal) oatmeal, or one cup of cornstarch. Soak for 20 minutes. Try some anti-rash recipes. There are many prod­ucts you can gently apply to the rash to help relieve the itching and dry up the blisters. Calamine lotion and Caladryl are both found in your local pharmacy. Other soothers you may try are aloe vera gel, hydrogen peroxide, or even apple cider vinegar. Some like it hot. Moist compresses, laid gently on the rash, may relieve your pain and itching. Doctors say to use whatever temperature makes you feel better, warm or cool. If you prefer a cold pack, try wrapping a bag of frozen peas in a thin towel. Sometimes, pouring ice water over the towel-wrapped area is easier to tolerate. Take a pill. Don’t overlook the simple remedy of aspirin, ibuprofen, or acetaminophen. If needed, your doctor can add a narcotic to your prescrip­tion. You might also find relief from a low dose of an antidepressant that would limit pain signals to the brain. Over-the-counter antihistamines will dry up the sores and maybe make you drowsy enough to sleep comfortably. Come in from the cold. Chilling your skin, whether you’re outdoors or in, makes it contract and shiver. This can make the itching worse. So stay out of those snappy breezes and air-condi­tioned drafts. Get rid of the gauze. Doctors recommend leaving the shingles blisters uncovered as much as possi­ble since air promotes drying and healing. Bandages tend to stick to the sores anyway, caus­ing even more discomfort. Get out of bed. While you may feel like moping around feeling sorry for yourself, it is important to stay active, both mentally and physically. And lying in bed may actually irritate your rash. So do that crossword puzzle, or keep up with a hobby. Your mind will stay off the pain, and the time will pass more quickly. Care for your kisser. If you develop blisters in your mouth, you will have to be especially gentle during your daily routine. Use a baby toothbrush, eat soft foods, and gargle with saltwater. Pursue that little virtue called patience. When you are in the middle of an illness like shingles, the symptoms may seem endless. But the condition usually clears up in about three to five weeks. If you don’t have the misfortune to develop another condition called postherpetic neuralgia (PHN), you’ll soon be your old self again. If you are over 60 and had a severe rash with the her pes zoster virus, you have a strong chance of developing postherpetic neuralgia. With PHN, you continue to feel pain for weeks or even years after your shingles attack because the virus has badly damaged your nerves. Unfortunately, it is difficult to treat. Pass the pepper, please. An over-the-counter cream containing capsaicin (Zostrix) is actually made from hot red peppers. It works by lowering your skin’s sensitivity to heat and pain. While capsaicin helped more than half of the PHN suf­ferers in a recent study, not everyone can tolerate it. Check with your doctor before using it and make sure all the initial shingles blisters are healed. Modern medicine or quack cure? Due to the severity of PHN pain, many sufferers will try any­thing. There are several treatments, such as elec­tric currents, injections, and neurosurgery, that have not been proven effective. However, antide­pressants, acupuncture, self-hypnosis, and biofeedback may give you some relief. Discuss any procedure with your doctor. Think positive. Many doctors insist that optimism brings about better results than any medical treatment. Research continues in the battle to treat herpes zoster, or shingles. The National Institutes of Health and other clinics and laboratories around the world are working hard to learn more about this common virus. Take heart that the next few years will see an effective treatment to relieve the severe pain and suffering this virus causes.